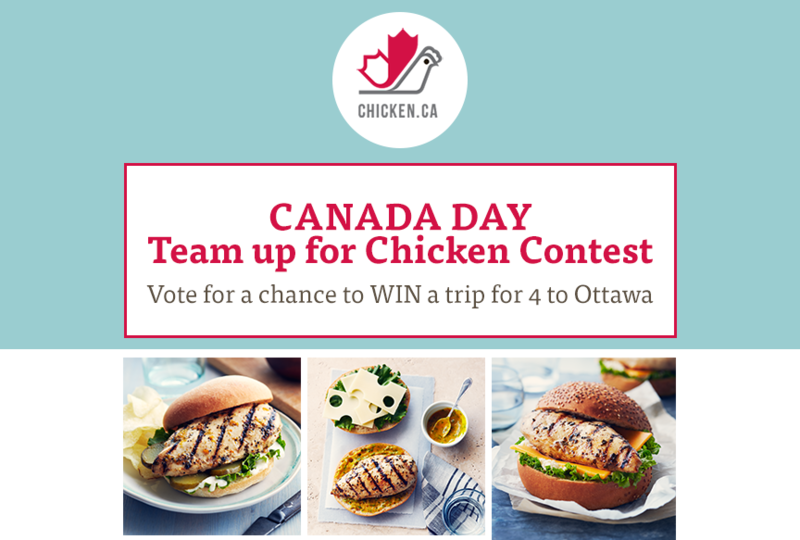 Chicken Farmers of Canada are gearing up for the annual Canada Day celebration in Ottawa by launching a the Team Up for Canadian Chicken contest which will see someone winning a trip for 4 to Ottawa for Canada Day! The Team Up for Canadian Chicken contest is live NOW and ends on ends on May 29th, 2014 at 11:59 p.m EST. It is open to Canadian residents, 18+. There are three prizes in total available to be won. First prize: A 3 day, 2 night trip for four to Ottawa to celebrate Canada with Chicken Farmers of Canada from June 30 to July 2, 2015). In addition, this lucky winner will also receive a Chicken Farmers of Canada prize pack, a Maple Leaf Foods prize pack and a $500 food bank donation. (Approximate value is up to $4,300, depending on the winner’s location). Second prize: Chicken Farmers of Canada prize pack, Maple Leaf Foods prize pack and $250 food bank donation. (Approximate value is $425). Third prize: Chicken Farmers of Canada prize pack, Maple Leaf Foods prize pack and $100 food bank donation. (Approximate value is $225). The contest is open to Canadian residents who are the age of majority in their province or territory at the time of entry. The contest ends on May 29, 2015 at 11:59 pm EST. To enter the contest, simply Vote for your favourite recipe from Chicken Farmers of Canada. There are three recipes to choose from – The Royal Gala Chicken Sandwich, The Coronation Creation Chicken Sandwich and The Preston Street Chicken Sandwich. Click on your choice and write 2 to 4 sentences explaining why you chose that recipe for your family. 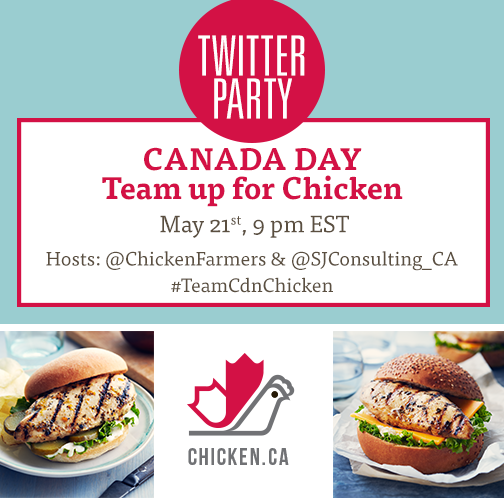 Join the #TeamCdnChicken Twitter party on May 21st at 9 pm EST !